DELIGHTFUL MOM STUFF: Heart Food! 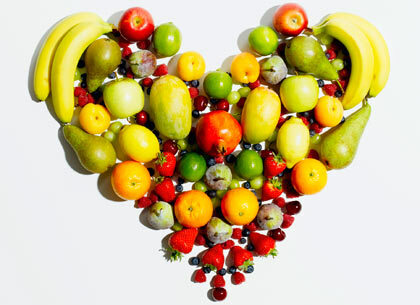 In honor of Valentine's Day, I am going to remind you of the top 25 Heart Healthy foods, according to webmd.com. Happy Valentine's day! 1. Salmon: Omega-3 fatty acids. 2. Flaxseed (ground): Omega-3 fatty acids; fiber, phytoestrogens. Ground flaxseed hides easily in all sorts of foods -- yogurt parfaits, morning cereal, homemade muffins, or cookies. 3. Oatmeal: Omega-3 fatty acids; magnesium; potassium; folate; niacin; calcium; soluble fiber. 4. Black or Kidney Beans: B-complex vitamins; niacin; folate; magnesium; omega-3 fatty acids; calcium; soluble fiber. Give soup or salad a nutrient boost -- stir in some beans. 5. Almonds: Plant omega-3 fatty acids; vitamin E; magnesium; fiber; heart-favorable mono- and polyunsaturated fats; phytosterols. 6. Walnuts: Plant omega-3 fatty acids; vitamin E; magnesium; folate; fiber; heart-favorable mono- and polyunsaturated fats; phytosterols. 7. Red wine: Catechins and reservatrol (flavonoids). Toast your good health! A glass of red wine could improve "good" HDL cholesterol. 8. Tuna: Omega-3 fatty acids; folate; niacin. Here's lunch: Salad greens, fresh fruit, canned tuna. Keep "Salad Spritzer" - a light dressing -- in your office fridge. 9. Tofu: Niacin; folate; calcium; magnesium; potassium. Tasty tofu is easy: Thinly slice "firm" tofu, marinate several hours, grill or stir-fry. 10. Brown rice: B-complex vitamins; fiber; niacin; magnesium, fiber. 11. Soy milk: Isoflavones (a flavonoid); B-complex vitamins; niacin; folate, calcium; magnesium; potassium; phytoestrogens. 12. Blueberries: Beta-carotene and lutein (carotenoids); anthocyanin (a flavonoid); ellagic acid (a polyphenol); vitamin C; folate; calcium, magnesium; potassium; fiber. Cranberries, strawberries, raspberries are potent, too -- for trail mixes, muffins, salads! 13. Carrots: Alpha-carotene (a carotenoid); fiber. 14. Spinach: Lutein (a carotenoid); B-complex vitamins; folate; magnesium; potassium; calcium; fiber. 15. Broccoli: Beta-carotene (a carotenoid); Vitamins C and E; potassium; folate; calcium; fiber. 16. Sweet potato: Beta-carotene (a carotenoid); vitamins A, C, E; fiber. 17. Red bell peppers: Beta-carotene and lutein (carotenoids); B-complex vitamins; folate; potassium; fiber. 18. Asparagus: Beta-carotene and lutein (carotenoids); B-complex vitamins; folate; fiber. Grill or steam slightly, then dress with olive oil and lemon. It's a pretty side dish. 19. Oranges: Beta-cryptoxanthin, beta- and alpha-carotene, lutein (carotenoids) and flavones (flavonoids); vitamin C; potassium; folate; fiber. 20. Tomatoes: Beta- and alpha-carotene, lycopene, lutein (carotenoids); vitamin C; potassium; folate; fiber. 21. Acorn squash: Beta-carotene and lutein (carotenoids); B-complex and C vitamins; folate; calcium; magnesium; potassium; fiber. 22. Cantaloupe: Alpha- and beta-carotene and lutein (carotenoids); B-complex and C vitamins; folate; potassium; fiber. 23. Papaya: Beta-carotene, beta-cryptoxanthin, lutein (carotenoids); Vitamins C and E; folate; calcium; magnesium; potassium. 24. Dark chocolate: Reservatrol and cocoa phenols (flavonoids). 25. Tea: Catechins and flavonols (flavonoids). Phytoestrogensare substances in plants (like flaxseed) that have a weak estrogen-like action in the body. Studies suggest that flaxseed lowers the risk of blood clots, stroke, and cardiac arrhythmias. It may also help lower total and LDL "bad" cholesterol and triglycerides, and even blood pressure. Phytosterols are plant sterols that chemically resemble cholesterol -- and seem to reduce blood cholesterol. All nuts and seeds, including wheat germ, have phytosterols. Polyphenols are another set of antioxidants that protect blood vessels, lower blood pressure, reduce LDL "bad" cholesterol. Flavonoid polyphenols include catechins, flavonones, flavonols, isoflavones, reservatrol, and anthocyanins. Non-flavonoid polyphenols include ellagic acid (found in all types of berries). Omega-3 fatty acids (found in fatty fish like salmon) and alpha-linolenic fatty acids (found in plant foods like walnuts) help boost the immune system, reduce blood clots, and protect against heart attacks. They also increase good HDL levels, lower triglyceride levels, protect arteries from plaque buildup, are anti-inflammatories, and lower blood pressure. B-complex vitamins -- like Vitamin B-12 (folate) and vitamin B-6 -- protect against blood clots and atherosclerosis, or hardening of the arteries. Niacin (vitamin B-3) helps increase HDL "good" cholesterol. Vitamins C and E are antioxidants that protect cells from free radical damage.Magnesium, potassium, and calcium help lower blood pressure. Fiber-rich foods help lower cholesterol levels.